One of three things can happen when I buy a new CD. Either it doesn’t meet my expectations and I rarely play it again. Or I love a handful of tracks and add them to my iTunes playlists for repeated listening. Or I adore the whole album from the first note to the last and have it on ‘repeat play’ at home and in the car – sometimes an aural binge lasts a couple of months before a new favourite takes its place. When I heard Caspar Babypants for the first time, I knew immediately a new favourite had arrived. 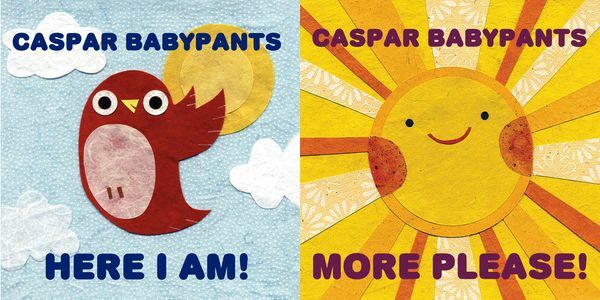 Here I Am is Caspar Babypant’s debut album for kids and it’s a fabulous combination of catchy original tunes and traditional songs such as Shortnin’ Bread and Freres Jacques. The lyrics are straightforward, sweet and easy to understand (which I think is very important for children). The standout track for me is Baby Bear – it’s like a Buddy Holly love song ‘kid-ified’. Other tracks have a solid bluegrass feel – Bug in the Cuff and Monkey River are both terrific – then there’s a change of pace with spunky little song The Island Hop. 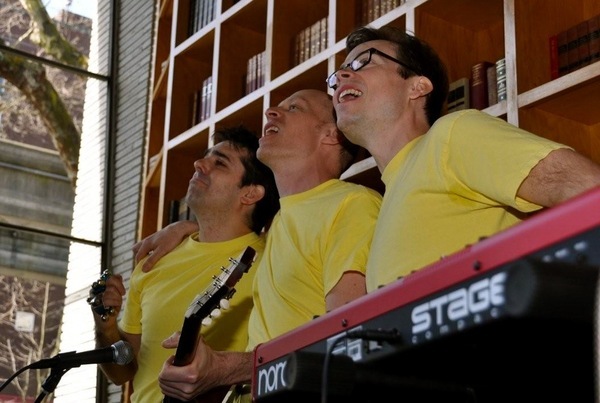 Caspar’s lyrics are pure and simple in a way that makes you think they might be cleverly making it up as they go along – songs like Bright Bug demonstrate this. Clearly Caspar fans asked nicely as More Please came shortly after Here I Am. More Please features the same successful formula of well-known songs and fresh sounds. Caspar’s recording of the childrens’ classic Itsy Bitsy Spider is the perfect track to show off their unique sound and kids will love to hear about Mary’s (who had a little lamb) friends including Jerry and his porcupine and Harry with his elephant. The bluegrass feel continues with tracks such as Dog Gone Gone Dog Gone and Cotton Eyed Joe. Standouts include the heartbreakingly sweet $9.99 and the musical garden adventure Rocks and Flowers. I also love the kooky sound of I’m a Nut and the superb lyrics of Made up My Mind is the truest ‘parent’s love song’ I’ve ever heard. Get your Caspar Babypants from Monkeytail & Wellington for $19.95 each. While you’re there, watch Monkeytail’s interview with Caspar Babypants for some insights into their music making.